the ex-tropical storm, and getting boarded by the Portuguese navy! We anchored inside the breakwater at the entrance to Portimão for some days, comparing it unfavourably to the anchorage at Culatra: if no swell from outside then plenty movement all day and night from the passing fishing boats and not a lot of room to swing. We were watching the weather forecast to see if there would be some fair weather days to anchor off Cape St. Vincent, the southwestern-most tip of Portugal, a beautiful spot but not very attractive to anchor in a swell. Instead we noticed alarmingly large red arrows on the gribfile charts announcing ex-tropical storm Nadine approaching us. Over 50 knots of wind straight into our anchorage! We considered waiting to see how things would evolve and move into the marina if it really would turn nasty, but in September the rates are € 55 a night. The other nearby marinas were even more expensive and so we decided to start moving. Back to Culatra at first although we wouldn't like to anchor there in a gale with a 2 mile fetch and remembering last October's gale which blew the roof off Faro airport. The forecast kept changing but then it predicted Nadine's path would be right along this coast in a few days time. Rather safe than sorry, is what we thought and made for the Guadiana. A few miles out of Culatra we saw a navy ship approaching us. We'd seen those ships before along the coast but this time they lowered a big rubber dinghy and they were alongside in no time. “Can we come on board?” Well, we couldn't really say no, of course. Two men on Eos, number three stayed in the dinghy and circled us, as did the big mothership. We had been hearing and reading many reports about yachts being boarded and having their safety equipment checked. The argument that your boat is equipped according to the rules of the country whose flag you fly does not count in Portugal. According to them that's only the case if you're passing through, not if you're visiting marinas and anchorages. The reports had all been rather different, but we'd understood that it was better to have no liferaft, flares, fire extinguishers etc than having outdated ones. This spring we had decided it would be best to avoid all hassle and so had our liferaft serviced, got one new fire extinguisher and some new flares. The two navy guys were quite polite and one spoke good English. “Do you have a radio?” Oh dear, as usual we hadn't had our VHF on and they'd been calling us. Bad start. They wanted to see the ship's papers, our passports and the “licence”, meaning some sort of skipper's certificate, which we had. “Where do you come from, when did you enter Portugal, where are you going to, and where after that.” We have been at anchor in Culatra for some weeks, we entered Portugal in July (we'd been to Ayamonte in June), we are going to Alcoutim and then to Ayamonte and Holland. “Will you leave the boat in Ayamonte?” Maybe, we don't know yet. All this was passed on by handheld VHF to the big ship. They were not interested in our VHF call sign or VHF papers, and the insurance papers and light house dues bill only got a cursory glance and they didn't mention anything about our passports being issued in Lisbon. Then the inspection. Liferaft certificate, though not the liferaft itself. All flares were looked at and every single one was noted down with the expiry date (non of the flares in the flare container was out of date). The new fire extinguisher mounted outside and its date was inspected. “Do you have more?” Yes, one in there and one in there. “Can I go in or can you get it out?” I took the one from the main cabin and pointed out the date on the newest sticker which the guy noted down without further look at the authenticity of it, if you get what I mean. They lost interest in number three, but wanted to know how many life jackets we had (4) and wanted to be shown, upon which we presented a non-self-inflating one and that was sufficient. We then had to sign a paper, which didn't mention much and I had to correct a birthdate. They didn't give us a copy and of course only later we thought we should have asked for one. Also we forgot to ask them if everything was in order. We were just too glad the inspection was over and they were gone! Two days after arriving at the Guadiana the forecast showed Nadine had decided to remain stationary in the Atlantic and we only got some rain from a “normal” low pressure system passing through. Our camera has been on strike and so not a lot of recent pictures are available. 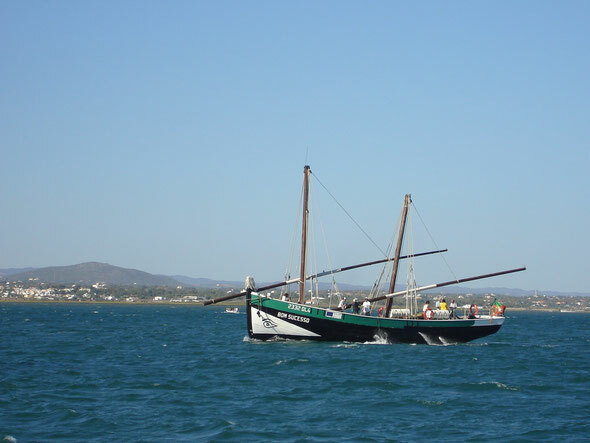 There are not many traditional boats still afloat in Portugal except for some fishing boats. This is a replica of a coaster, now used for tourist trips.